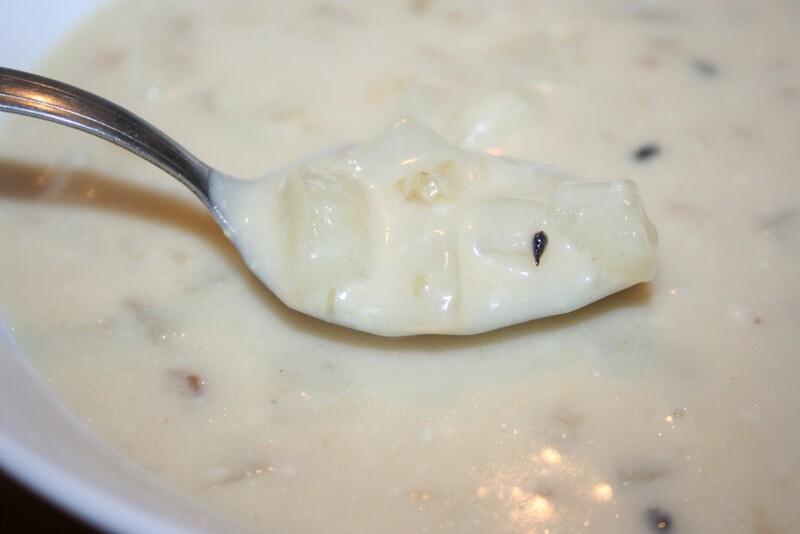 I believe it was my dad that found this wonderful soup recipe on the internet somewhere. Mom made it and raved about it many times. I finally asked her for the recipe and eventually made it. It is a delicious potato soup! And it is really simple to make. Dice some onion and celery, very finely. Dice the potatoes into smallish, bite-size, pieces. Now the original directions said to bring these to a boil until the potatoes are tender and the veggies are soft. I don’t like to chance it, so I saute the onion and celery in a tiny bit of oil to get them soft first. The reason there are black specks in my pictures is because I left the heat on too high and burnt them a tiny bit. 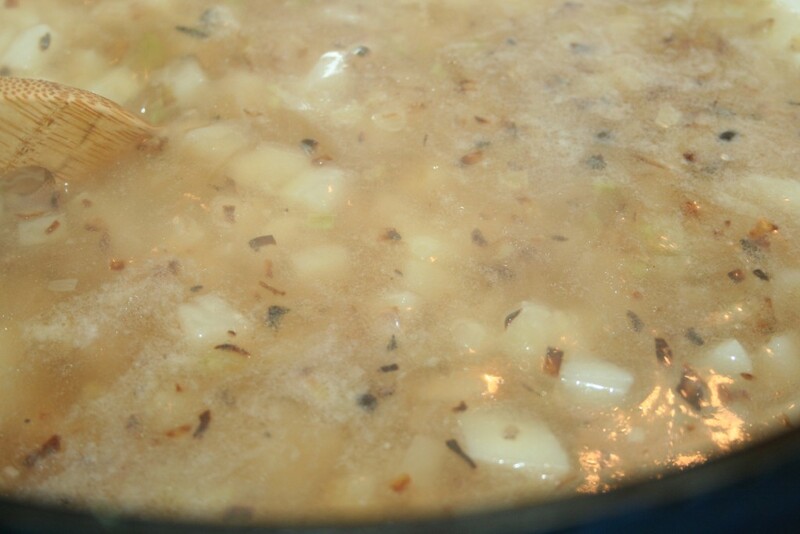 After the onions and celery are softened, I add the potatoes and water. Cook about 10-15 minutes. When the veggies are tender, add chicken bouillon, salt, and pepper. Meanwhile, melt five tablespoons of butter in a pot. 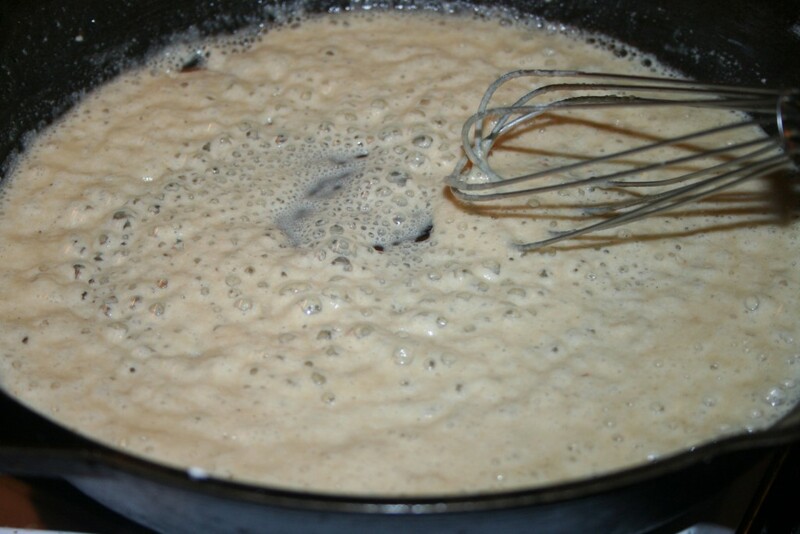 Add five tablespoons of flour and whisk together. Add the milk and keep whisking until it thickens, just a few minutes. Add it to the potatoes, veggies, and broth, which I didn’t get a picture of because I was trying to take the pictures and cook too – not an easy task. Yes, that’s a burnt piece of onion. The original recipe added ham to the veggies and water in the beginning but since Mike is allergic to pork I just serve it with crumbled turkey bacon. Either saute the celery and onions in a teaspoon of oil or so. 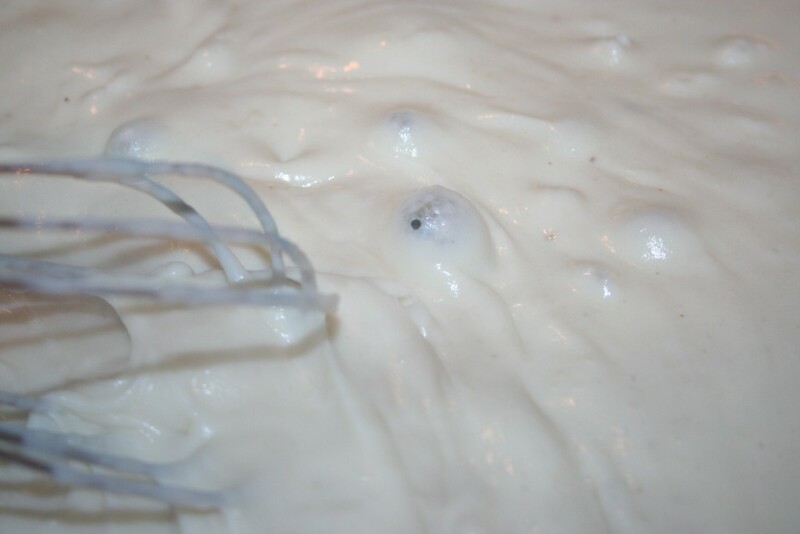 When softened, add potatoes and water. 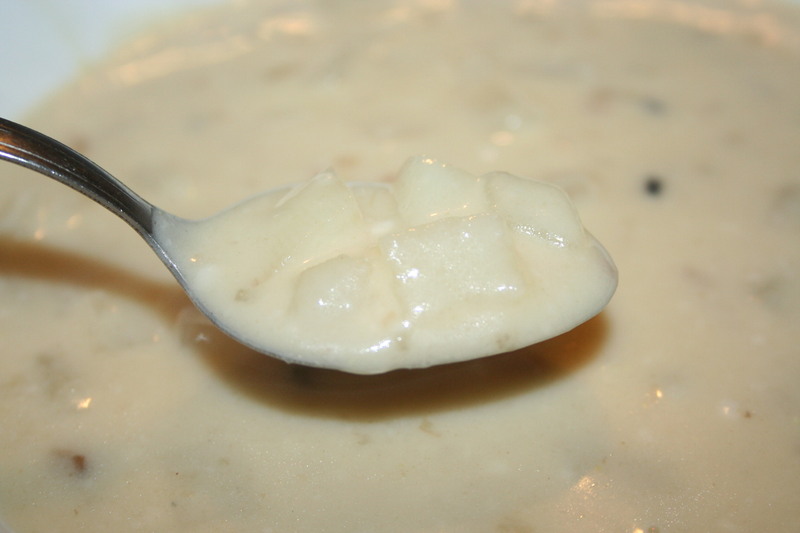 OR combine all three (with the ham, if desired) in water and bring to a boil. Stir in the bouillon, salt, and pepper. Whisk in the milk and continue whisking, until thickened. 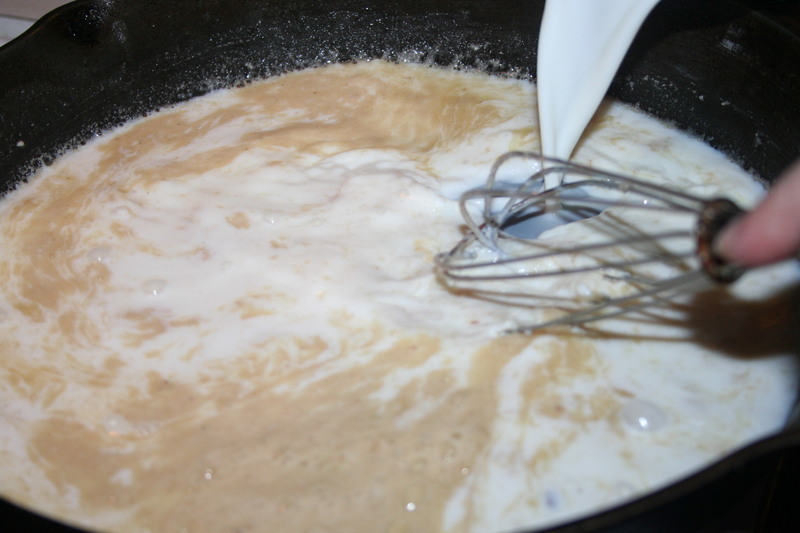 Stir this milk mixture into the veggies and broth. 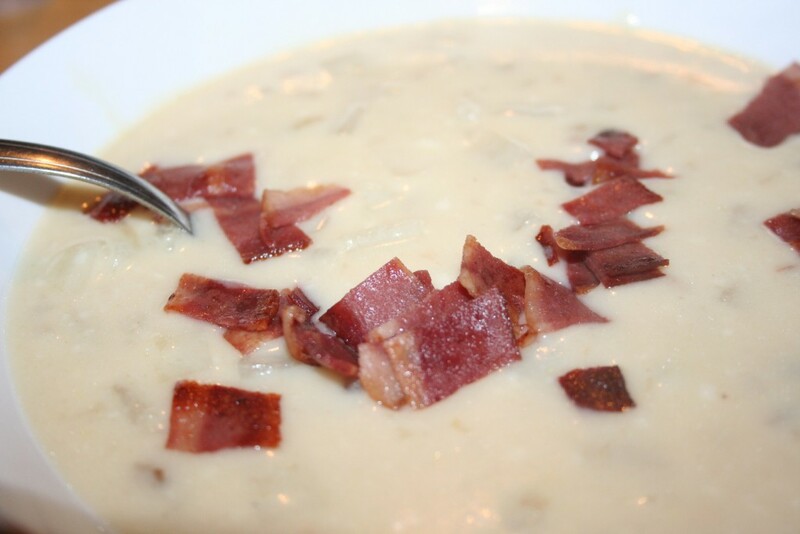 Optionally serve with crumbled bacon (instead of the ham). I hope you enjoy the thick and cream soup, good with or without the bacon or ham.